MP3s: The More You Sell (retail motivational training from The Happy Listener's Guide to Mind Control) and Kris Jensen's Torture. Hi, I'm currently deployed to Iraq and recently discovered your program. Since then My tank crew and I listen whenever we get the chance. The reason I'm writing is that we have been looking for anything we can find by happy flowers, not just because I think My Skin Covers My Body is the greatest record of all time, but also It's perfect for Psychological Warfare. Well, the only song we have here is Charlie Got a Haircut and we've used it so much, we can't stand it. Basically I wanted to check if you know somewhere we can score some Happy Flowers we can then load onto an Ipod to use on the Iraqis. Any suggestions would be appreciated. I'm not revealing the name of either our DJ or the Army Sergeant who sent this, but his e-mail included his unit, his armor company and his address in Iraq. The headers on the e-mail indicated that the originating ISP was located in the Middle East. The DJ and I wondered what this meant - whether it was a joke or not, how best to respond, whether to respond at all. In the end, he replied that: sorry, we aren't able to send you a Happy Flowers MP3 to torture the Iraqis with, but here are a few places you might be able to find one of their CDs. In case you're not familiar with Happy Flowers, they're a duo that screams songs of childhood nightmares in chipmunk-like voices over noisy music. Unsettling, but satisfyingly cathartic, in small doses. Could definitely be effective for psychological warfare, as we learned in the 80's when their song I Wanna Watch Cartoons (realaudio from Irwin's 12/31/03 show) was in heavy rotation on WFMU. The threats and tears poured in to the station switchboard. We received this e-mail six months before the revelations of Abu Ghraib, so the only context I had to put this in were two well-reported incidents of the military using popular music specifically to harass the enemy: in 1989, when the army blared various songs into the Vatican embassy in Panama as Manuel Noriega holed up inside, and the 1993 siege in Waco, Texas, when the FBI blasted a wide assortment of recorded songs, chants and sound effects into the Branch Davidian compound. Somehow, I had missed the revelation in May, 2003 that the army was using Metallica's Enter Sandman and Barney the purple dinosaur's I Love You to torture Iraqi detainees, playing the songs repeatedly at high volume inside of shipping containers. . It all started making sense a few weeks ago, when I read Jon Ronson's recent book, The Men Who Stare at Goats. In the book, Ronson follows the implementation of an influential 1979 military document called the First Earth Battalion Operations Manual (html version here and pdf version here). This document, by retired Lieutenant Colonel Jim Channon laid out an idyllic vision of a US military that would lead the world to paradise through peace, love and telekenisis. It reads and looks like other great Seventies classics like Our Bodies, Our Selves and The Whole Earth Catalog, only it's a military manual. 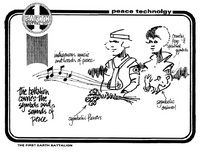 The image at the left is from the original edition of the First Earth Battalion Manual, and it depicts US troops arriving in foreign lands carrying baby lambs, armed with flowers, indigenous music and words of peace. 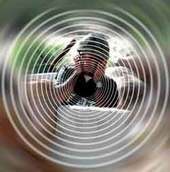 As the influence of the First Earth Battalion Manual spread, psychological operations units within the military started experimenting with "remote viewing," telepathic assassination, teleportation and the use of music in military operations. That's where the staring at goats comes in - psyops units actually had a goat lab where soldiers attempted to think goats to death. But I digress. Ronson argues that it is the twisted misinterpretation of the First Earth Battalion which led not only to Abu Ghraib but to the military's bizarre implementations of music. Whether the music was supposed to deprive Noriega of sleep, merely annoy him or provide good times and diversions for the US troops is not known. But the playlist is certain. By 1993, in Waco, Texas, things got a little weirder. The FBI was blasting music into a compound again, but this time they were mixing it up with sound effects. Tibetan Buddhist chants, screeching bagpipes and Nancy Sinatra's These Boots Are Made For Walking were interspersed with the sounds of crying seagulls, dying rabbits, helicoptor rotor blades, sirens and dentist drills. Not only that, but the FBI's DJs started getting creative on the wheels of steel. Branch Davidian Clive Doyle, one of the few survivors of the fire that killed Koresh and his followers, later said "Rarely did they play a song straight through. They distorted it by slowing it down or speeding it up." But the FBI and ATF were also beginning to play with quieter sounds at Waco, sounds so quiet that the conscious mind can;t even hear it. Whether such techniques work or not is another matter. Ronson reports that during the lengthy telephone negotiations between Koresh and ATF/FBI negotiators, subliminal tapes were played in the background of the conversations in the hope that Koresh would hear the voice of God instructing him to surrender. One of the weirdest musical episodes described in The Men Who Stare At Goats concerns a detainee at Guantanamo Bay. Jamal al-Harith is a British website designer who was arrested by US troops in Afghanistan shortly after 9/11 and ended up in Guantanamo Bay for two years, before being released for lack of any evidence against him. In the course of being interrogated, Jamal was seated in a vacant room with a boombox. Occasionally a military intelligence officer entered with a CD and said "Here's a great girl band doing Fleetwood Mac songs." The CD would play, and when it ended, the officer would come back into the room and say "You might like this," and put on a Kris Kristofferson record. Then Matchbox Twenty. Ronson makes the case that the music Jamal was forced to listen to was embedded with subliminal messages encouraging him to spill all his Al Qaeda secrets. It seems that the military has quite an interest in the work of Doctor Oliver Lowery, who in 1992 received US patent # 5,159,703 for the Silent Subliminal Presentation System, "a silent communications system in which non-aural carriers in the very low or very high audio-frequency range are amplified or frequently modulated for inducement into the brain." But it's not like this technology is limited to the military. $400 will buy you a subliminal message encoder from the Lorelei Communications Group. Of course, if you want the "finest mind manipulation system" possible, that will cost as much as $3400. It's enough to make you long for the overt (and audible) mind control techniques known as motivational recordings. Yes, back in the good old days, you could hear the messages that were aimed at your psyche, like this hilarious in-store motivational recording from a manhattan based clothing boutique from the Eighties (mp3, right click to download). It was a rainy day, Saturday afternoon, and I was stuck working at an automated oldies station. "MacArthur Park" came on, and I nearly jumped out the window. It was then that I started mixing in Screamin' Jay Hawkins. In particular (scroll down) a small write-up of cases of treasonous DJs trying to screw with the heads of US military listeners during wartime. This is not 100% true. The US forces do not delive bad music only into enemy's ears. If you ever had the chance to listen to any AFN (armed forces network) operated radios/TVs then you will discover that they also play the same kind of crud over and over again to their own people... and the civilians around. This is cruel! I see where they are going, but having just listened to 2:30 of the Happy Flowers track, its coming off as counterintuitive to me. On one hand, the military is blasting this music at someone who, based on there role in the scenario is technically being tortured. This ultimately makes the military the torturer, obviously. On the other hand, this is a bit like Raskalnikov in Crime and Punishment, where the murder is tortured by his own conscience, or in this case, they have to listen to this as well. And the Happy Flowers are the least of it. "I'm Gonna Tear Your Playhouse Down"? Metaphor aside, that is one terrible song.